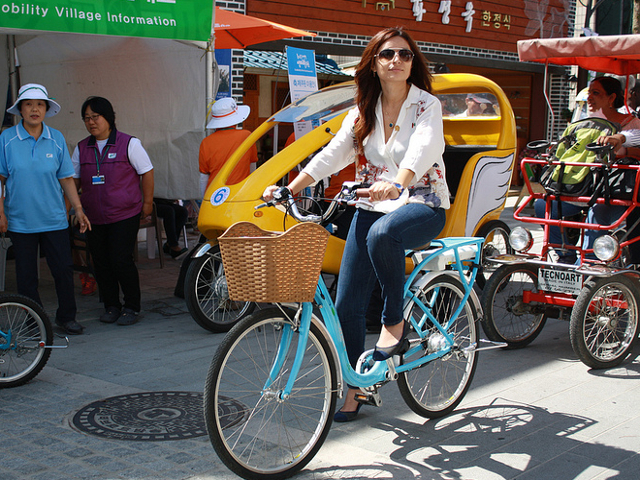 The EcoMobility World Festival has turned one neighborhood in Suwong, South Korea, into car-free city for one month. Photo by ICLEI-Local Governments for Sustainability. For the month of September, Suwon, South Korea has transformed into a city of the future. 18 miles south of Seoul, Suwon is the capital city of the province of Gyeonggi-do, and is home to over one million inhabitants. Suwon has embraced the ideals of EcoMobility: environmentally friendly, equitable transport for all. The month long EcoMobility World Festival, which began on September 1st and runs until the end of the month, features cutting edge non-motorized vehicles, cultural events, a four-day “EcoMobility World Congress,” and car-free streets. Most impressive is that the 4,300 residents of the Haenggung-dong neighborhood in Suwong have been persuaded to swap their cars for eco-mobile vehicles and live a car-free lifestyle for the entire month. Haenggung-dong, which is one of the most crowded neighborhoods in Suwon, has now been designated a car-free zone. The 1,500 fossil-fuel vehicles registered in Haenggung-dong have been moved away and placed in temporary parking lots, and the streets are now filled with a marvelous mix of sustainable vehicles and people. “If we can’t build a truly eco-mobile city, why not assemble a temporary one for a month?” said Konrad Otto-Zimmermann, Creative Director of the Festival. One of the purposes of this festival is to model for the world what an eco-mobile city might look like, and to prove that such a life style is not only possible, but preferable. Along with the demonstration of a functional, eco-mobile city, the Festival features a long parade of cutting edge vehicles, ready to take the place of the car. Thousands of international visitors –including policy makers, CEOs, and political leaders – will not only witness how a neighborhood can abandon cars for one month, but will also have the opportunity to test a slew of human and electric-powered vehicles from around the world. These options for sustainable, personal transport include the world’s smallest foldable electric bike, a tricycle that can carry two additional passengers, bike trailers, an ambulance bike, and light electric vehicles. This festival, which strives to showcase a functional eco-mobile society, is backed by a 12 million USD public investment to regenerate the inner city of Suwon. Mayor Yeom Tae-Young has made it a priority to transform the city into one that prioritizes sustainability and accessibility, particularly for low-income residents. The festival is designed to both revitalize and improve Suwong, and serve as an example of sustainable transport and equitable living for cities on all continents. This post was inspired by a similar post on TheCityFixBrasil by Luísa Zottis.